Megan Prestridge with her daughter, Kara. Courtesy of Megan Prestridge. 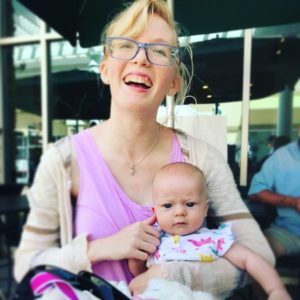 When Aeroflow Healthcare announced an expansion of its maternity leave policy in November, it was more than a nice, new perk for Megan Prestridge. It was life-changing news. Then, Asheville-based Aeroflow announced its expanded maternity leave policy – from two weeks to six weeks for maternity leave, and two weeks of parental leave for fathers. That meant Megan would now get six fully paid weeks of leave. “It was amazing. It was such a relief,” Megan said. Daniel Polich, a senior recruiter for Aeroflow, helped the company navigate the creation and implementation of several new family-friendly policies over the past year. He said incorporating family-friendly practices is a conscious choice for Aeroflow as it experiences rapid growth. and one year of free diapers for the first year of a child’s life or date of adoption or foster placement. Additionally, Aeroflow built a pumping room for breastfeeding mothers at its Asheville headquarters, which is open to both employees and Aeroflow patients. With a comfy chair, a mini fridge, a sink and a changing table, it’s a space that feels welcoming to moms and their babies, Megan said. Aeroflow’s pumping room for breastfeeding employees and patients. Courtesy of Aeroflow. As a parent who works at Aeroflow, Megan said she feels valued, which makes her want to plan a career at the company she loves. Attracting and retaining talent, along with increasing employee engagement, was a definite motivator for the company, and it’s a strategy that’s worked, Polich said. Do your homework. Polich and his colleagues did their own research on the benefits of family-friendly policies, templates for how to implement and the business case study. He also enlisted help from Moms Rising and the North Carolina Breastfeeding Coalition. Get feedback from employees. The Aeroflow Improvement Movement, a group of employees who provide feedback to company leaders, has been instrumental in helping to hone workplace policies and culture. Review and revise as needed. Polich stresses that Aeroflow’s policies are a continual work in progress. For more information on Megan and Aeroflow’s Breastpump Specialists, visit https://aeroflowbreastpumps.com/megan-prestridge.